Cost: Tuition $210. Member Tuition $170. Materials Fee $40. This traditional basket, from the 1800's, with an open-work base and four legs, serves to raise its contents off the floor, allowing air to circulate within the basket. 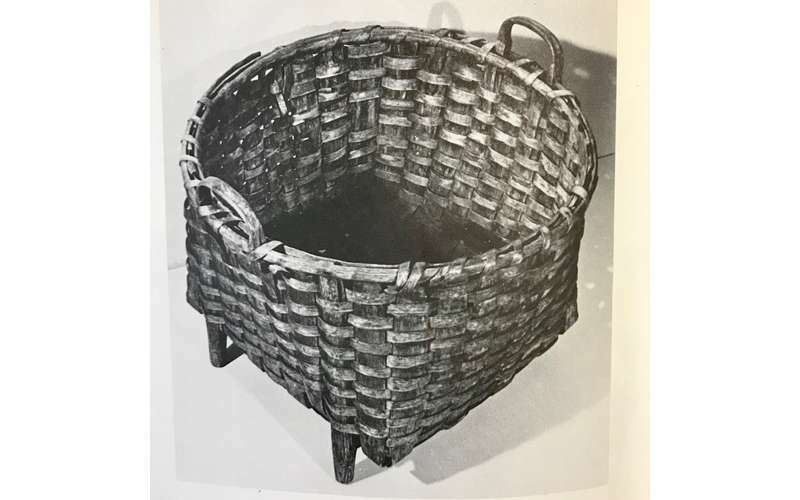 Every self-sufficient household had this multi-purpose basket for processing the sheared fleece from their sheep; first rinsing the "grease" or lanolin from the wool in hot water through the open-work base, and then allowing the fleece to dry before carding, having the wool raised above the floor. Today, this basket still has a multitude of uses, but more often holds balls of yarn, reading materials, or anything else you want conveniently located by your chair side. Weaving with reed, students will recreate this basket from the NY State Historical Society in Cooperstown, NY, bringing home a historic, functional piece. Included will be a bunch of fleece from Barbara's sheep to make your piece truly authentic! The basket is approx. 16" high, 16" diameter.